Home » Opinion » Grannies for Nannies? It is interesting that the government has anticipated the need for increased nursing and professional helath-care workers to staff the nursing homes being planned. 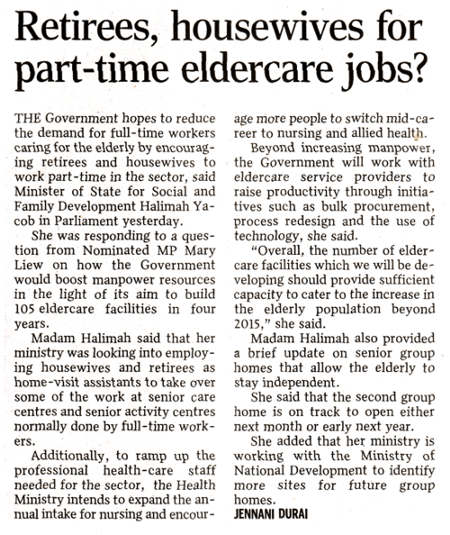 The government hopes to employ mostly Singaporean retirees and housewives for this purpose. Same here! I mean I agree. There is a large pool of people in Singapore who are not working full-time, but who have a lot to offer. The benefits go both ways. What is more fulfilling: Watching soap operas on TV all afternoon? Or taking on the challenge of helping raise the next generation of Singaporeans? These jobs pay reasonably well, too. So after a year of being a nanny you can treat herself to a month's holiday overseas. It's a lot better than rotting in front of the TV. "Grannies for Nannies" is a serious proposition, just as is Stay-at-Home Mums for nannies and babysitting jobs. The hardest part for a nanny is finding the best family to work for and the hardest part for a family is finding the right nanny. Nanny, babysitter, maid or transfer maid?